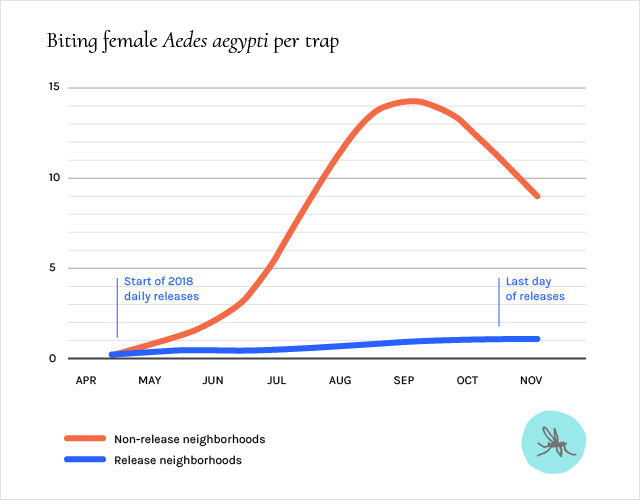 Verily Blog: Debug Fresno 2018 results in 95% suppression! and soon after, preparation for a second year began. Throughout the winter, we continued to develop our automated production and release systems and designed plans for the 2018 mosquito season with our partners, Consolidated Mosquito Abatement District (CMAD) and MosquitoMate. In April 2018, we hatched the first batch of eggs, fueled up the release vans, and embarked on a plan to conduct the world’s largest study of Wolbachia-based Sterile Insect Technique targeting Aedes aegypti. The overall goal of our 2018 study was the same as in 2017: test whether releasing sterile male mosquitoes reared and released using Debug’s automated systems could achieve strong suppression of Aedes aegypti mosquitoes in our release areas compared to similar non-release neighborhoods. For Debug Fresno 2018, we aimed high by expanding our release areas to include three suburban Fresno County neighborhoods and increasing the variety of landscapes in the study. We also started at the beginning of the season before the wild mosquito population had the opportunity to reproduce in large numbers, in hopes that we could continue to have a large impact while releasing fewer male mosquitoes. As in 2017, we adjusted according to data and feedback from the field and compared the number of biting female Aedes aegypti in release and non-release areas at peak season to tally our final result. The outcome was decisive. Our data indicates that we achieved a greater than 95% reduction in the number of biting, female Aedes aegypti mosquitoes compared to similar, non-release neighborhoods (confidence interval: 93.67 - 96.78). Aedes aegypti is a highly invasive mosquito that has proven difficult to combat with conventional mosquito control methods, so strong suppression across three different release areas is an important validation of a new approach to controlling these mosquitoes with a dangerous potential to transmit human disease. Above, the trend of biting, female Aedes aegypti mosquitoes within our three primary release neighborhoods compared to similar non-release neighborhoods, starting in April 2018. Our team worked closely with our Debug Fresno partners, CMAD and MosquitoMate, to gain insights on program performance and design. Critically, our data suggest that a suppression rate beyond 95% was limited in our release sites by incursions of female Aedes aegypti mosquitoes from neighboring non-release areas, indicating that integrated control strategies and larger release areas may make this approach even more effective. We also showed that starting early in the season is a highly efficient strategy to achieve maximum suppression. This information provides invaluable guidance for future Debug programs both in the US and abroad. Verily Sr. 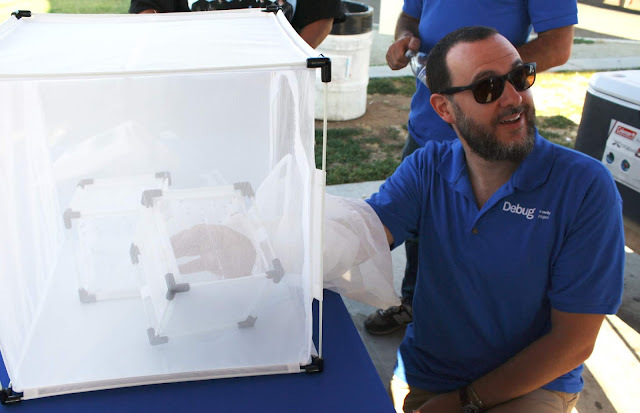 Scientist Jacob Crawford shows a local community member our demo box of sterile, male mosquitoes who may land on your hand - but like all male mosquitoes - cannot bite. As the mosquito season winds down in Fresno County and we wrap up this year’s field study, we want to sincerely thank the community residents who welcomed us in 2018. Aedes aegypti is not just a nuisance, but also a potential public health threat to the people of the Central Valley of California and actively dangerous to millions of others around the world. We are energized by what we achieved this year and look forward to bringing this technology to communities most burdened by Aedes aegypti throughout the world. As Debug Fresno’s second season comes to a close, we are excited to share our 2018 results as well as some of the key insights we have learned along the way. Around this time last year, we were wrapping up Debug Fresno’s first season and soon after, preparation for a second year began. Throughout the winter, we continued to develop our automated production and release systems and designed plans for the 2018 mosquito season with our partners, Consolidated Mosquito Abatement District (CMAD) and MosquitoMate. In April 2018, we hatched the first batch of eggs, fueled up the release vans, and embarked on a plan to conduct the world’s largest study of Wolbachia-based Sterile Insect Technique targeting Aedes aegypti.